Cleanliness may be next to godliness, but it’s definitely before productivity. For the daily grind of a writer, nothing numbs your work rate like clutter. In the digital age of publishing, writers now have two desks to maintain. First, your physical wooden, steel, or LEGO desk. And second, the visual “desk” of your computer or digital word processor. Those loyal to a daily writing regiment don’t need to worry as much. However, for the procrastinators and excuse makers, a messy desktop makes for a delicious yet unhealthy excuse to avoid writing. 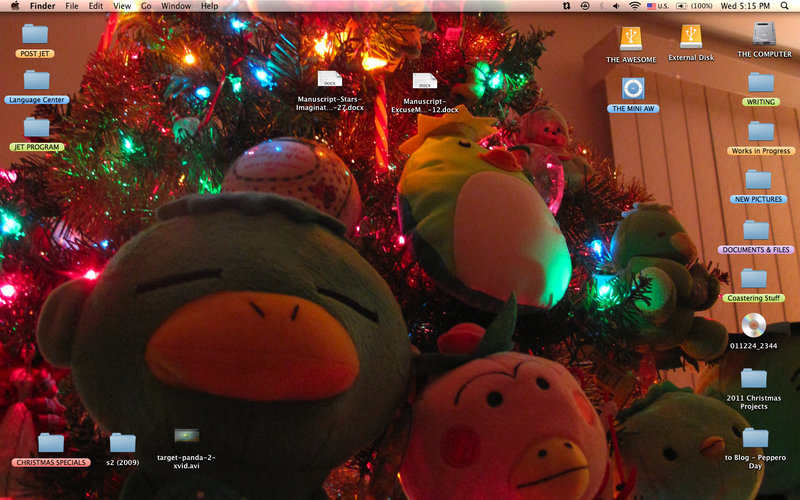 Generally speaking, my Mac OS desktop is organized akin to what you would expect from an obsessive compulsive. Especially when it comes to writing, there’s a menagerie of intricate folders containing everything from ideas, to inspiration photos and drafts. The magical world of Harry Potter must have whirled itself within J.K. Rowling for years before it became a world wide sensation. But at some point she needed to sit down and scribe every word of the seven book series. So where do authors pen their inspiring works of fiction? What do these desks, spaces, crevices, and creative caves look like? Amazing Year Day 329: Word of the Day? Receive notifications of new 'Crave Writing' posts.